The last evening for the Bentleyville "Tour of Lights" display at Bayfront Park was celebrated last evening with a fireworks display as temperatures hovered around 10F. Bentleyville ended its third year in Duluth and is quickly becoming a wonderful Holiday tradition for many families. CAP T TOM MACKAY a long time resident of Park Point sent in this picture of him out for a sail on the Duluth Harbor " Hard Water". Ahoy Denny. As you stated I have lived on the Point for a long time, 1944, with the first two days of my life spent up-town at St. Lukes. This is a photo of my Mom on my Dads Iceboat around 1939, just so you can see how this sport got in my blood. The other photo is of my first Iceboat the "Sputnic" named after a current event back a few years ago. A misspell of Spitnik. Operational note for Ipad users! On the IPad you have an option to view the mobile version of the site or the web version. Some users have reported that they have a different format -- this is the mobile version. If you scroll to the bottom of the page you will see a link to " View Web Version" - this should open up the standards version with the camera thumbnails. So, if the format looks different -- go to the "View Web Version" at the bottom of the screen. The Federal Sakura arrived at 20:45 last evening and is the last saltie (ocean going vessel) of the season. When a cold tear drop rolled down my face, I could tell if it was because of the cold breeze blowing off Lake Superior or the nostalgia of seeing the last ocean freighter of the year. Two tugs waited in the inky black water to assist the boat to Peavey Elevator for a load of grain. The snowstorm blinded many of the cameras from seeing yesterday. The video shows what was available. Labels: Frontenac, James R. Barker, Lee A. Tregurtha, Walter J. McCarthy Jr.
On this day in 1940, the USS Paducah—training vessel of the Duluth Naval Militia—and her crew of naval reservists from Duluth arrived in Brooklyn, New York, where it would spend the next few years training sailors for battle during the Second World War. Launched in 1904, the Paducah was a Dubuque-class gunboat that joined the U.S. Navy’s Caribbean Squadron in 1906. During World War I the Paducah operated out of Gibraltor, escorting convoys on the way to North Africa, Italy, the Azores, and Medeira. She returned to duty in the Caribbean before arriving in Duluth in June of 1921, replacing the USS Essex. From 1940 to 1945 the Paduch was a common site on Chesapeake Bay, where she trained Naval Armed Guard Gunners. The gunners were sailors and officers who served on armed merchant vessels because the navy itself did not have enough ships to protect the merchant fleet. After the war the Paducah was sold to an individual in Florida, who then sold her to the Israeli group Haganah and renamed her Geula or “Redemption.” She was eventually turned into a merchant ship before being sold for scrap in 1951. Read the Veteran Memorial Hall’s entry on the Paducah here, and the personal story of Paducah sailor Steve Blach here. Labels: CSL Niagara, Erieborg (Dutch), Federal Yukina, Indiana Harbor, James R. Barker, Paul R. Tregurtha, Walter J. McCarthy Jr.
Duluth’s Leif Erickson replica Viking ship was built in Norway in 1926 for Captain Gerhard Folgero. According to historian Pat Labadie—whose father and grandfather built the boat—the Leif Erikson was a 42-foot wooden “femboring” craft “patterned after the traditional Norwegian working craft that served coastal shippers and fisherfolk for centuries [and was] used by medieval Norse adventurers and explorers.” So the Leif Erikson is not a precise replica of a Viking craft but a representation of the same class and style of boat likely used by Leif Erikson himself. Captain Folgero and his crew outfitted their vessel with carved head and tail pieces and wooden shields bearing Viking devices and sailed the dressed-up fishing boat from Bergen, Norway, to the coast of Labrador and beyond, supposedly following much of Leif Erikson’s original 1002 route. It wasn’t easy. They faced hurricane-like winds, icebergs, and weeks of fog. But they made it to Labrador and on to Boston, covering 6,700 miles in 50 days. From Boston they sailed on to Duluth to take part in a national convention of Norwegian emigrants. By the time they arrived here they had covered roughly 10,000 miles. That they accomplished this in a 42-foot boat outfitted with only oars and a square sail is nothing short of remarkable. That’s when congressman William Carss suggested Duluthians raise funds to purchase the ship and move it to Lakeshore Park, then rename the park in the boat’s honor. But it was Bert Enger and Emil Olson, West End furniture dealers and Norwegian immigrants, who purchased the boat and gave it to Duluth for all to enjoy, and indeed Lakeshore Park was rechristened Leif Erikson Park. The boat was once considered Duluth’s second-largest tourist attraction, just behind the Aerial Lift Bridge. In 1984 Neill Atkins and Will Borg, Emil Olson’s grandson, established Save Our Ship (S.O.S.) to renovate, preserve, and protect the vessel. They have struggled to raise fund to properly protect the boat, displaying a mixed record of stewardship. S.O.S.’s ironic initial idea was to not save the boat at all but to scrap it (the News-Tribune suggested she be burned in Lake Superior, like a Viking funeral). S.O.S. would then build a longboat-style warship to replace it, even though the boat was modeled after Viking merchant vessels built before the Norsemen became marauders. Due to budget concerns, the replacement plan itself was scrapped and a renovation plan put into place. It took years to raise the funds, but a major overhaul was accomplished in 1996. The boat was then freed from a chicken-wire enclosure that had protected it for years and then moored in a more elegant berth within the park. Fear of vandals, however, has left it covered in shrink wrap waiting for a proper home. In 2012 another group of developers proposed moving the boat to a retail development to be constructed at the “Lafarge” site, just west of Bayfront Park. That project has not materialized. Labels: American Century, CSL Niagara, Lee A. Tregurtha, Walter J. McCarthy Jr.
With the recent snowfall, I was prompted to get out in my backyard and take some pictures of snowflakes using my camera and a special microscope. Enjoy this snowflake video as you wait for more boats. On this day on Lake Superior in 1905, a great storm began, known to many as the “Thanksgiving Storm” and, more often, the “Mataafa Storm.” The storm produced hurricane-force winds, and the water on Lake Superior’s western end was so high it drove through Minnesota Point at a spot known as “the barrens” hard enough to cut a channel. That day and the next, twenty-nine ships were wrecked or suffered damage, seventeen were stranded, and at least one foundered. The human toll was also heavy; the storm took thirty-three souls, nine of them just outside Duluth’s ship canal. The Mataafa, hauling a load of iron, steamed hard for the canal and safety beyond it. But as the Mataafa entered the canal, currents and wind gusts forced the ship into the north pier; conditions then carried it back into the lake before slamming it broadside against the pierhead. About 150 yards from shore, the Mataafa settled to the lake bottom and split in two. Members of the U.S. Life Savers stood helplessly on shore, the storm too strong to launch their lifeboats. That night thousands of Duluthians lined the shore, standing vigil as the storm pounded the wounded ship. When the Life Savers finally reached the ship the next morning they found fifteen sailors—including the ship’s captain—alive. Unfortunately, nine of the crew either drowned or froze to death. Read more about the Mataafa storm here and a sample of the newspaper coverage of the event here: MataafaStorm_11.29.1905_DNT,MataafaStorm_11.29.1905_02_DNT, MataafaStorm_11.29.1905_02_DNT,MataafaStorm_11.30.1905_DNT, MataafaStorm_11.30.1905_02_DNT. Labels: Algolake, American Century, Walter J. McCarthy Jr.
Labels: American Century, James R. Barker, Lee A. Tregurtha, Walter J. McCarthy Jr.
Due to a strong cold front passing through the region, we had the first "Sea Smoke" appearance of the season. The is a wonderful time of year for watching the sea smoke rise off the warm (relatively) waters of Lake Superior in columns of steamy fog. The Mayflower was the ship that transported English and Dutch Separatists and other adventurers to Plymouth, Massachusetts in 1620. From 1609 through 1620, the Mayflower was used almost exclusively as a cargo ship carrying English goods (primarily cloth, fox and rabbit furs, and iron and pewter goods) to France and Spain, almost always returning home fully laden with French wines, and occasionally some vinegar and salt. Like many ships of the time, the Mayflower was most likely a carrack with three masts, square-rigged on the foremast and mainmast but lateen-rigged on the mizzenmast. The ship's dimensions are unknown but estimates based on its load, weight, and the typical size of 180-ton merchant ships of its day, suggest a length of 90–110 feet (27.4–33.5 m) and a width of about 25 feet (7.6 m). In July 1620, the ship was hired, along with the ship Speedwell, and the two embarked on their first voyage attempt on August 5. The Speedwell was leaking too much, so the two ships put in to Dartmouth for repairs. The second voyage attempt was made August 22. The two ships made it 300 miles out into the Atlantic before the master of the Speedwell, William Reynolds, decided the ship was too leaky to continue. Both ships turned back, and put in to Plymouth, England. There, the decision was made to leave the Speedwell behind and only take the Mayflower. About 20 people, decided to quit the voyage and go home. The remaining 102 passengers and goods were packed onto the Mayflower, and embarked from Plymouth, England to America on September 6: this time for good. As the passengers aboard the Mayflower journeyed across the Atlantic, tensions arose among the three factions: the Separatists seeking religious freedom, the merchant-adventurers seeking their fortune, and the crew seeking their livelihood. It became apparent that if these passengers were to survive in an alien land, they needed to consent voluntarily to a cooperative form of government. Thus it was that the Mayflower Compact came into being and was signed by the adult male passengers in November, 1620. "In the name of God, Amen. We, whose names are underwritten, the Loyal Subjects of our dread Sovereign Lord, King James, by the Grace of God, of England, France and Ireland, King, Defender of the Faith, e&. Having undertaken for the Glory of God, and Advancement of the Christian Faith, and the Honour of our King and Country, a voyage to plant the first colony in the northern parts of Virginia; do by these presents, solemnly and mutually in the Presence of God and one of another, covenant and combine ourselves together into a civil Body Politick, for our better Ordering and Preservation, and Furtherance of the Ends aforesaid; And by Virtue hereof to enact, constitute, and frame, such just and equal Laws, Ordinances, Acts, Constitutions and Offices, from time to time, as shall be thought most meet and convenient for the General good of the Colony; unto which we promise all due submission and obedience. In Witness whereof we have hereunto subscribed our names at Cape Cod the eleventh of November, in the Reign of our Sovereign Lord, King James of England, France and Ireland, the eighteenth, and of Scotland the fifty-fourth. Anno Domini, 1620." There followed the signatures of the 41 male passengers. This compact established the first basis in the new world for written laws. After a three month voyage through a stormy North Atlantic, the Mayflower's crew sighted Cape Cod on November 9; they attempted to sail south to an area around the mouth of the Hudson's River, near modern-day Long Island, New York. They nearly shipwrecked at some shoals to the south of the Cape nicknamed Tucker's Terror; narrowly escaping, the decision was made not to try that again--they would go back and explore Cape Cod. They anchored off Provincetown Harbor on November 11, and over the next month they put out several expeditions to survey Cape Cod and the vicinity. By mid-December, running out of both patience and provisions (including beer, the primary beverage since water was usually contaminated with parasites), the Pilgrims decided upon the area we now know as Plymouth Colony. They continued to live out of the Mayflower for several more months, making trips to land to build storehouses and houses. Constructing homes and storehouses proved to be very slow going: many were sick and could not labor hard; bad weather frequently prevented much work from being done; and the few structures they did build occasionally succumbed to fire. By April, the weather started turning for the better, the people's health began to recover, so on April 5, 1621, the Mayflower set sail home for England, arriving back on May 6, bringing letters and news of the successful establishment of Plymouth: but with a devastating 50% loss of lives, and with no profit (lumber, furs, fish) sent home as cargo. After returning home, the Mayflower was again employed in a trip to France, bringing home to London a cargo of salt. Shortly thereafter, her master and quarter-owner, Christopher Jones, fell sick. He would die in March 1623. By 1624, the Mayflower, which apparently had not been used since October 1621, was sitting in ruins in the river Thames. She was appraised for a pathetically low $300, including the suit of worn sails and an old pitch pot and kettle. Undoubtedly the ship was sold off as scrap lumber. Following is a contemporary account of the 1621 Thanksgiving written by Edward Winslow in a letter dated December 12, 1621. Read more about theBannockburn here and here. Labels: Alder, Algorail, American Century, Arthur M. Anderson, Indiana Harbor, James R. Barker, Lakes Contender/tug Ken Boothe, Paul R. Tregurtha, Sr.
On this day on Lake Superior in 1886, the steam barge Robert Wallace—as well as her consort, the schooner barge David Wallace—sunk after over a day of being pounded by waves and running ashore at Chocolay, four miles east of Marquette on Michigan’s Upper Peninsula, on November 18. They had been taking a combined 104,000 bushels of wheat downlake from Duluth when they encountered the storm. Initially all hands on both vessels were thought loss, and efforts to save them were hampered by the storm. U. S. Life-Savers stationed at Michigan’s Portage Ship Canal, 110 miles away, took a train through the storm—a blizzard on land—in order to reach the crews. Both vessels sank, their loads of grain said to have “fed the wildlife of the Michigan Coast.” All were saved, but elsewhere the storm cost forty lives and financial losses of over $620,000, $300,000 for the two Wallace vessels and their cargo alone Twenty-eight vessels were damaged and most, including the Wallace and the Wallace, were rebuilt and returned to work on the lakes. On November 17, 1902, the Robert Wallace sunk once again, just southeast of Two Harbors with a load of iron ore, but her consort, the Ashland, did not sink—and the Wallace was not raised. Read newspaper coverage here (wallace_11.19.1886_DWT, wallace_11.26.1886_DWT, wallace_12.3.1886_DWT) and read about the unlikely rescue here. Thank you for all the comments that I have received on the new Live Streaming Camera. I do listen to suggestions and critiques and try to make adjustments when possible. I can read between the lines your love for Duluth and the harbor and I appreciate that, since I feel the same way. Technology has been advancing rapidly and although not perfect, it is now possible to "virtually" stand on a rooftop or hillside and get the feeling that you are truly here. I have now upgraded a second camera for Live Streaming. This camera, located on top of the Great Lakes Aquarium, is a high resolution view of the Aerial Lift Bridge that also includes sound. A truly live view, with sound has been a dream of mine for a long time, and is now possible (yet not perfect). While many of us can't live in Duluth, let alone afford some "Hillside" real estate, you can now tune into these new streaming camera for your daily nautical fix. Although there will always be tweaking and adjusting on these cameras, I hope you enjoy them as much as I do. Also, make sure to try out the "Full Screen" feature. Click on the second image on the right to access the camera. Labels: Algoma Quebecois, Algosoo, American Century, Indiana Harbor, Marietje Deborah (Dutch), Mesabi Miner, Vikingbank (Dutch), Vlieborg, Walter J. McCarthy Jr. I have completed installing the new LaFarge camera. I still have some adjustments, but, the basics are up and running. FYI, I will be replacing the camera located on top of the LaFarge Silos (fourth camera from left on homepage) this afternoon. Expect an outage of several hours. The new camera is state of the art and should give us an incredible view of the Aerial Lift Bridge and harbor for years to come. This day in 1913 marks the start of one of the biggest storms sailors on the Great Lakes have ever experienced. The so-called “White Hurricane” (also called the “Big Blow” and the “Freshwater Fury”) was essentially a blizzard producing hurricane-force winds and technically considered an “extrapolated cyclone.” Between November 7 and 10 the storm produced 90 mph wind gusts, 35-foot waves, and whiteout snow squalls, beaching many large vessels. A lull in the storm on November 8 caused many to think the storm was over, and shipping traffic that had been delayed was resumed, sending more vessels out into what would soon become the teeth of the storm. 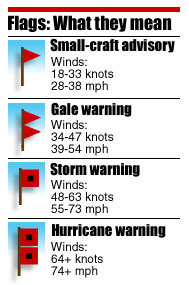 Ports around the Great Lakes raised gale-warning flags, ignored by many ship captains. Cleveland was hit with 22 inches of snow. A brand-new $100,000 breakwater in Chicago was swept away. On Lake Superior, the Leafield was wrecked near Angus Island, taking 18 people down with it; theHenry B. Smith sunk near Marquette, Michigan, with 25 lives lost. Neither vessel has ever been found. Stranded on Lake Superior were the Fred G. Harwell, the J. T. Hutchinson, the Major, the William Nittingham, the Scottish Hero, the Turret Chief, the L. S. Waldo, and the passenger steamer Huronic (some newspapers mistakenly reported the Huronicas the Hamonic, its sistership). In all, nineteen ships were destroyed, nineteen other stranded, and 250 people died. Read Wikipedia's description of the storm here.